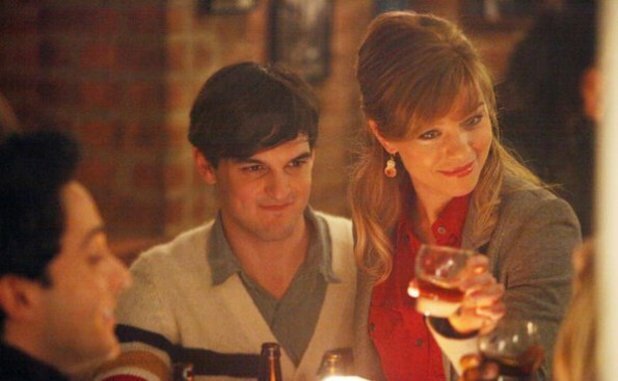 There are two ways to look at Smash‘s final Tuesday-night outing: You could feel depressed that NBC is pushing its musical dramedy to Saturday nights, where it’ll be whacked with the Grim Reaper’s scythe like a piñata at a child’s birthday party. Or you could raise the adult beverage of your choice and rejoice that this week’s episode featured the indomitable Bobby and another one of his bitchy quips. IVY LYNN HAS A MOTHER OF A REHEARSAL | The episode opened with Tom trying to get word to Ivy Lynn (Megan Hilty) that he’d hired her exhausting mother (who didn’t even show up to the opening of Liaisons!) to play the role of Marilyn’s mom in Bombshell. Ivy Lynn got the news just as Leigh burst through the door and sucked up every bit of oxygen in the joint, but still managed a feeble “Yay!” (Julia’s response — “It’s only been five minutes. Who knows what’ll happen after the shock wears off.” — was one of the night’s best zingers.) Instead of clashing, though, Ivy Lynn and Leigh tried so hard to be polite that their actual acting suffered. “They’re turning Norma Jean and Gladys into the Gilmore Girls,” sighed Tom. The neophyte director, however, eventually got the gals to go down memory lane — Leigh recounting stories of Ivy Lynn’s childhood obesity and her audition as young Kurt in The Sound of Music, Ivy Lynn sharing how mama instilled in her a deep inferirity complex — and suddenly it wasn’t just the scene that was dripping with tension. “At least the best part of my career is in front of me,” snarled Ivy Lynn, showing some of the bitchery that made her so fun in Season 1. The toxic mood led to a lovely rendition of “Hang the Moon,” Marilyn’s mom’s deathbed song of regret and contrition, and it really was a treat to see Broadway standouts Peters and Hilty doing their thing together (even if the Chinese lanterns were oddly distracting). Offstage, though, things didn’t end so beautifully, with Ivy Lynn telling her mom that once the show opens, “I’ll never need you again,” and then dropping this bomb on duplicitous Tom: “We’re not friends. I work for you now, and that’s it.” Ouch! KAREN’S DAD GETS A SNEAK PEEK | As Karen and Jimmy nuzzled and made coffee the morning after getting it on — was anyone else hoping we’d misremembered last week and that it would be Derek waking up in her bed? — Karen’s dad arrived. Jimmy snuck out the window, but as he entered the apartment, Mr. Cartwright caught a glimpse of leather jacket amidst the curtains. (If I’d been in his shoes, I’d have called 911: “Yes, send a patrol card! There’s a sociopath on my daughter’s fire escape!” But I’m paranoid about home invasion like that.) Later, attending Hit List rehearsals, dear old dad noticed Derek’s leather jacket — and mistakenly began to blame the philandering director for using “Little Derek” to lure his daughter away from a huge Broadway role to a far less career-launching production. A BAD MAN DOESN’T KILL OFF JIMMY (OR WHATEVER HIS NAME IS) | Remember when Jimmy broke into a dude’s apartment to get the book for Hit List, and got punched in the face? That dude came back this week, tracking Jimmy down to his rehearsal space and shaking him down for the money he owed. Oh, the dude is a drug dealer, and Jimmy owed him $8,000 that he stole on his journey to getting a fresh start. (Not much of a fresh start when it begins with theft, is it?) When Derek caught Jimmy looking for loot in people’s coats during the Manhattan Theater Workshop fund raiser, he agreed to loan the young composer the money. “You don’t have a monopoly on youthful indiscretion,” said our wordly Brit. Of course, that was before Derek knew Jimmy had violated his direct order not to get involved with Karen. And, of course, that was before Jimmy took a couple powder-filled baggies from Mr. Dealer as his parting gift for making good on his debt. “Have a good one, Collins. It’s Collins, now, right?” said Mr. Dealer, introducing the idea that Jimmy has a (dun dun dunnn) secret identity. EILEEN AND TOM DO SOME STUFF, TOO | Oh, Eileen is flirting with NY Times Guy (someone, get her a real plot! and a martini to throw!). Karen seems sad/confused/wan about Jimmy wanting to keep their relationship secret. (“If that’s what you want,” she said, once again subsuming her own feelings for those of her man). And Sam is now a backup chorus boy on Bombshell but kind of hating Tom. Anyhow, over to you! What did you think of this week’s Smash? On a scale of one to Ellis, how crazy do you think Derek will get now that he knows about Jimmy sleeping with Karen? Did you buy Ana getting the attention of the NY Times dude? Did you kinda wish the drug dealer had put Jimmy in the East River with some cement shoes? Did you tear up like Julia at the end of the Leigh-Ivy Lynn duet? Sound off in the comments!